I was trying to install kubuntu 15.10 with the official image(downloaded from kubuntu.org) from live-usb, created with usb-creator-kde. The notebook had already installed windows 8 in uefi mode. However, the "type" field of /dev/sda2 was fat32 and there was no option "efi" if I tried to change it, only "reserved bios partition", ext2, ext3, ext4, ntfs and so forth. I also was worried by the fact that ubuntu have not recognized existing windows installation, usually it provides option of "installing alongside windows"
As I understand, this happened because I logged in with legacy live-usb kubuntu mode rather than uefi, however I don't see any other option during startup and if I try to manually add "uefi" option to the start command parameters I get kernel panic. What is the proper way to make live-usb with ubuntu for uefi computer? What is the proper way to make Live USB with Ubuntu for UEFI computer ? Create a working USB drive by using the disks tool from within Ubuntu. Open it and select Restore Disk Image from the menu on the top right. So far everything seems to be just the way it should be. Install Ubuntu to the already existing partition sda6. But the device for boot loader installation – you have to select sda. The boot loader will automatically be installed to EFI partition sda2. Fat32 is uses for Linux. NTFS is used for windows partitions. You can also install Linux alongsode Windows and use the windows boot manager if it will save any troublr. You need to delete the efi folder in your drive and reinstall once your done installing all operating systems. You shouldn't have to repartition. Also if you're having trouble with partitions, DOS command has a partitioning utility. You simply must use DOS strings and set the portion by KB integers from 0 to say 256000 in order. 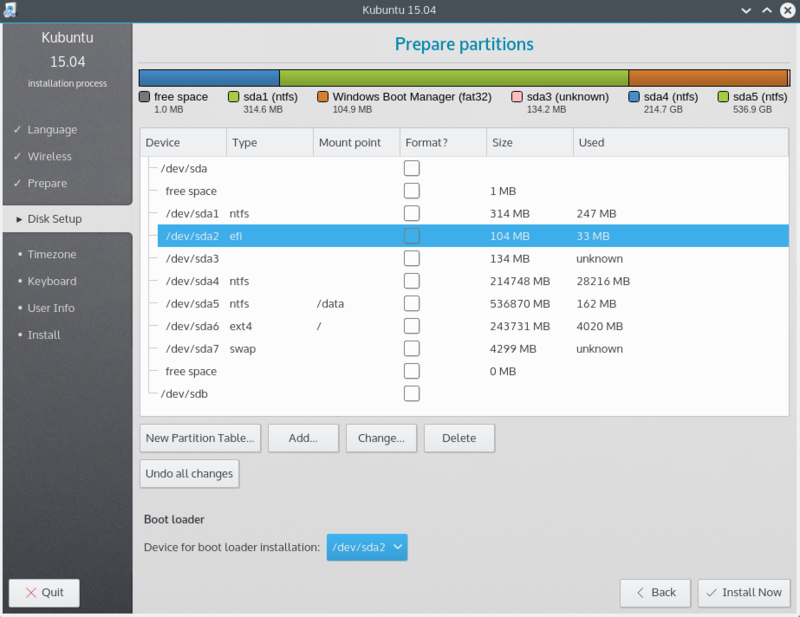 So your second partition might start at 45,128 for example but its size must match with the other partitions and if you,re not exact you may have to use a better formatting utility. Not the answer you're looking for? Browse other questions tagged boot dual-boot partitioning uefi live-usb or ask your own question. What is a UEFI bootable Ubuntu USB?